The Milwaukee Brewers celebrate after beating the Chicago Cubs, 3-1, in the National League tiebreaker at Wrigley Field on Oct. 1, 2018 in Chicago. Josh Hader pitched the eighth and ninth innings to record the save. Corey Knebel was the winner. Starter Jhoulys Chacin gave up just one run, in 5.2 innings of work. The Brewers won’t play in the NL Wild Card game Tuesday night. Instead, the Brewers will play Thursday when they begin a best of five National League Division Series. The first two games will be at Miller Park. Milwaukee’s opponent won’t be known until the end of another tiebreaking game Monday, as the Colorado Rockies are facing the Los Angeles Dodgers, for the NL West championship. The loser of that game plays against the Cubs in Tuesday night’s NL Wild Card game in Chicago, and then the winner of the Wild Card match-up will head to Milwaukee for the start of the NL Division Series. So, it’s possible the Brewers have not seen the last of the Cubs in 2018. The Milwaukee Brewers play the Chicago Cubs in Chicago Monday to determine which of the two teams wins the National League Central Division championship and the playoff schedule for both. The clubs are tied at the end of the scheduled 162-game regular season, so will play a tiebreaker beginning at 12:05 p.m., at Wrigley Field. The Brewers and Cubs were also tied going into Sunday's play. The Brewers pounded the Detroit Tigers 11-0, while the Cubs came back against the St. Louis Cardinals and won 10-5. Both finished at 95-67. Following the Brewers game Sunday at Miller Park, Brewers Manager Craig Counsell praised his team for winning nine of their last 10 games, to force the tiebreaker. "It's contributions from a ton of guys. We had guys certainly at the forefront. But we had contributions from so many guys, " Counsell said. 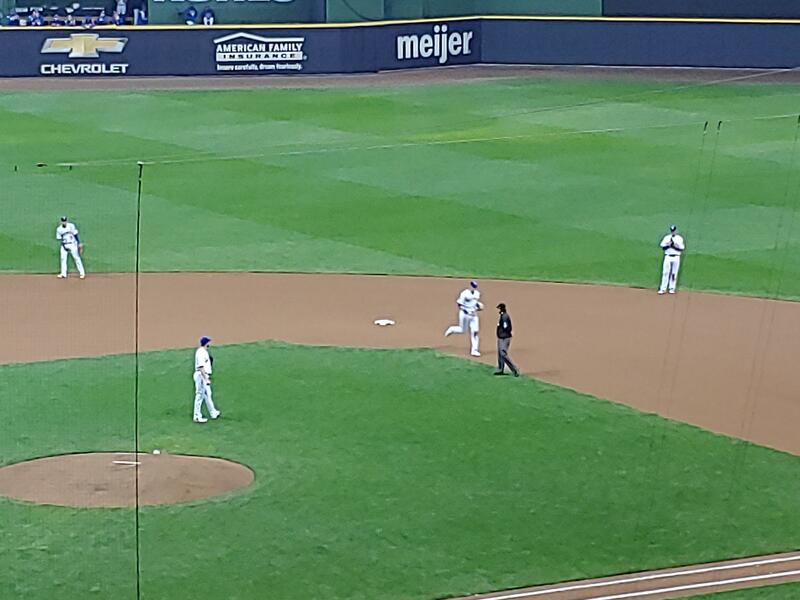 Brewers star outfielder Christian Yelich (near umpire) runs off the field Sunday at Miller Park. Monday's game, which is game 163 of the Brewers and Cubs regular season, will be in Chicago because the Cubs won the season series, 11-8. Counsell said it's good the Brewers did better against the Cubs in the latter half of the season: "If we didn't turn it around, we wouldn't be going to Chicago." The manager added that the two teams know each other well. "Look, we're familiar foes. There's nothing to hide really. There's nothing new to discuss when you're playing them, necessarily. It'll be a fun atmosphere and an interesting game," Counsell said. In another National League tiebreaker Tuesday afternoon, the Colorado Rockies take on the Dodgers in Los Angeles, for the NL West crown. The losers of the two Monday games play a winner-take-all Wild Card game Tuesday. If the Brewers lose Monday, they will host the Wild Card game Tuesday night at Miller Park. If the Brewers win Monday, they will be off until the beginning of the National League Division Series, (NLDS) Thursday in Milwaukee.